SmartVault works with thousands of accounting firm customers, who service tens of thousands of clients every year via SmartVault’s secure client portal. Over the years of working with accountants, we’ve taken what we’ve learned from our accounting professional friends, and put together some easy-to-use folder templates that you can use to easily build out your folder structure for each of your clients. With tax season upon us, we thought our tax accountant friends would be especially interested in the templates we’ve developed for servicing tax clients form the SmartVault client portal. It’s really easy to create your Vault and folder structure based on these templates… just download the template you want, copy it to your SmartVault Drive, and duplicate it for each client. 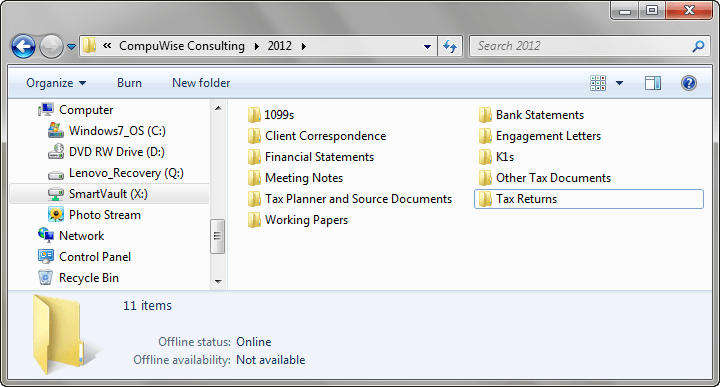 Then from the client portal, you can give your clients access to their specific folders and subfolders. If you’re using lots of different types of templates, you can create a Vault for storing your templates, so you can easily locate the right structure each time you onboard a new client. And of course if the templates you see here aren’t exactly what you’re looking for, you can tweak them for your own use, and duplicate your unique version as needed. Either way, give ’em a shot, and let us know what you think! If you have any questions about how to get started with client folder templates, send an email to support@smartvault.com or give us a call at (866) 674-6785 – our Customer Care Heroes are ready to help!